Infusion d'Iris is the latest fragrance release from Prada, and I was looking forward to smelling it on several counts. Iris is one of my favorite notes, and the iris perfume sold on a small scale in the Prada boutiques a few years back (sorry, not sure if it is still there or not) was lovely. I've also been impressed with Prada's mainstream perfumes to date, and I am especially fond of Prada Man, so I was excited to hear that the same perfumer who created that scent (Daniela Andrier) did Infusion d'Iris as well. My first impression wasn't entirely positive. The first thing you need to know about Infusion d'Iris, if you haven't smelled it yet, is that it is light. Really light — hence, perhaps, the massive vat of juice the model is swooning over in the ad shown above. It is just a wispy little slip of a scent. On my first encounter, I sprayed a little on a card, and thought it quite nice, but within an hour, it didn't smell like anything worth worrying about either way. Still, on my next shopping trip, I sprayed a little on skin on the way out of the store. It is just as well that Infusion d'Iris wasn't actually for sale yet, as I might have gone back to buy it on the spot. The top notes (notes include mandarin, orange blossom, galbanum, iris, incense, benzoin, cedar, lentisc and vetiver) are bright and sunny, with a nicely juicy orange tempered by a bit of greenery. It smells summery and fresh, but without the sharpness of say, Acqua di Parma Iris Nobile. After that, everything seems to join in all at once, and the early stages, where a pale sheet of iris is laid over incense, resins and woods is simply gorgeous. It is earthy, but not nearly so much so as some other iris favorites, and it doesn't have that turnip-roots-caked-with-dirt thing that some (not me, mind you) find disagreeable in scents like Serge Lutens Iris Silver Mist or The Different Company Bois d'Iris. It gets smoother and softer the longer it is on skin, but I found it much more engaging on skin after several hours had passed than I did on a card. It is soft-spoken, but not dull at all, and while it calls for a more liberal application than you'd expect for an Eau de Parfum — and even then, don't go looking for major sillage — it is actually rather tenacious in terms of lasting power. I won't claim that Infusion d'Iris is wildly innovative, but it has a kind of quiet elegance that isn't often found in mainstream designer offerings, and it is so nice to find something in a department store that doesn't smell like it has been focus-grouped into banality. It isn't hard to imagine Infusion d'Iris being released by a niche house for considerably more money than the $68 I paid for my 50 ml bottle. And don't worry about Andrier's "clothing of the woman" phrase; a man could easily wear Infusion d'Iris. Prada Infusion d'Iris comes in 50, 100 or 200 ml Eau de Parfum spray; 400 or 750 ml splash with 30 ml flask and funnel; and in a variety of bath and home fragrance products including linen water and candle. It appears to be exclusive to Neiman Marcus at the moment, but I assume it will eventually be found in the usual places. Great review! I liked Infusion very much too. I might get 50ml. Robin, I almost fell over last week when I read that you'd bought a bottle! I bet you've bought less than 10 (less than 5?) this year. So I considered it a ringing endorsement. I haven't made it over to Saks/NM yet, but I will pronto. M, I actually like the bottle in person more than I did in pictures — they did a nice job on the packaging. Wish I could remember how long it took the earlier Pradas to get to discount, although was noticing earlier today that Prada Pour Homme isn't marked down very much at either scentiments or imaginationperfumery. I wonder when this one will make it to the UK? I've had it on my Lust List for so long – it's agonising to hear about it from the other side of the pond. It's hardly any consolation that we get the Beckham things before you, LOL! how long exactly before a fragrance turns? No way of knowing, it depends on too many factors — the scent's composition, the storage conditions, etc. well, I keep mine in a cabinet, away from light and heat.. Am I safe for about a year or so? Very few scents will spoil in less than a year, so I'd say yes. Most are safe for several years at least, and some will last far beyond that. And some that start to “turn” really only lose the top notes, and are still perfectly wearable. R, I am not a huge fan of iris scents, but your review made this sound so simple and lovely, that I am intrigued enough to seek out a sample of this. Also, I very much like the mod look of that giant square bottle. I've got scents (I bet most of us do) that I've had for five, ten, even fifteen years with no noticeable change whatever. I've had a couple that turned after five or six years, and one that went nuclear after a year or so (very disappointing–practically a full bottle, and the colour darkened DRAMATICALLY over the course of a few weeks, with a corresponding degradation in the scent). There's no way to predict, although it's usually a good bet that if you treat them right they'll last a long time. Will add that actually, a few in my collection have actually improved with age. Trying to decide if I would love Infusion d'Iris if I wasn't a fan of iris, and can't decide. Certainly, if what you normally object to is the rootiness/earthiness (not a word, I guess), it is in control here, and there is none of the massively powdery-girly stuff either. But still, it smells mostly like iris. So now I'm curious, do let me know what you think when/if you try it. K, nice to see you! I like the bottle. The cap is wrapped in pale greenish paper, I think, meant to look like cloth. Very pretty but probably going to pick up fingerprints eventually. Otherwise, very retro looking. Let me know what you think when you try it! This & EL Private Collection Tuberose Gardenia are IMHO the best mainstream scents so far this year. You're review was a perfect description for the juice. I had just scored a really super deal for the ELGardenia Tuberose ($30.00)a couple of weeks ago, so I *justified* my Saturday splurge of Prada Id'I–the little voice in my head says “It's the perfect Indian Summer transistion scent to fall” HAHAH ! When will I learn to stop listening to that a nagging little voice??? The glass vials are surviving, but there's that plastic cap. shudder what do you think is the life of a sample? R, I'd love to know the other 2 scents you've bought this year…. do tell! So true. Don't think it is just interaction w/ plastic (majority of spray mechanisms, even for high end, are made w/ plastic), but also the huge air exposure created when you make the sample/decant, and the lack of an airtight seal (caps aren't crimped on). Still, I have samples that are 5 years old & just fine, in other cases, have some that haven't made it for a year. I bought Estee Lauder Azuree Soleil and a mini of Kenzo Flower Oriental (which perhaps doesn't count as it's a mini)? And would have bought Private Collection Tuberose Gardenia, but a friend kindly gave me a bottle after finding out what a hard time I had giving away the one sent to me for review by EL. What is really weird is that all of these are mainstream scents. My purchases for 2005 & 2006 were virtually all niche. Have not yet tried the new scents from 06130, but hope to do so soon! I do like their Yuzu Rouge very much. Sadly, this smelled dull and plasticky on me. Must try again to see if it gives the same effect. I was quite disappointed as iris is one of my favorite notes. i admit i didn't give this a test on skin – but i will. what i smelled on paper was woody and resinous – the middle and bottom notes – especially the cedar – came straight to the top for me. but the whole effect was light. not striking, but very pleasant. The Infusion d'Iris to my nose is similar to L'artisan's Dzonghka. Did you get that similarity? The structure is almost like a reverse of the usual — I do get some citrusy top notes, but then everything appears at once and it fades to something like what you would normally think of as heart notes. It has really grown on me since trying it the first time, but not sure I would call it striking either — just really charming, perhaps. D, Just tried them together to see, and yes, in the top notes for sure! How interesting, wouldn't have thought of it. After that they seem to take off in slightly different directions…Dzongkha gets spicier, earthier and deeper, and has more of an exotic feel, while IdI seems to get paler and more transparent the longer it is on skin. Do you like the IdI? You are right on with your observations of how they go in opposite directions in the drydown. You perfectly described the difference between the two. I cannot wear Dzonghka because it becomes rather masculine on me. I like the IDI more in the top notes stage then in the drydown which becomes rather linear on me. Still on the fence about investing in a bottle. Well, it is quite true: all the action is in the beginning, then the only change is that it gets softer and smoother. It doesn't seem to have a classical structure at all. I do like it, but it would also be nice to have a deeper version (I know they're calling it an EdP but it doesnt' wear like one) where the incense lasted longer. I wonder if Prada might consider a spicier extension; they lightened their last release—maybe they'll go in the heavier direction for another version of “Infusion d'Iris”. Either way, it's exciting to smell notes that are neglected by other current houses/brands, in a new fragrance. These days, iris rarely gets a chance to sparkle and preen. Okay, you've convinced me. I love the whole-plant-in-dirt concept, but I'll order up a decant. Just got a sample today. Unfortunately, this smells exactly like baby shampoo on me. I am constantly searching for the ultimate orange blossom scent (and have found many good leads on this site! ), so I was hopeful, but, alas, this one is not for me. Ouch, baby shampoo! What is your closest-to-ultimate orange blossom so far? One that I've been meaning to revisit is Norma Kamali. Samples of Infusiion D'Iris recently arrived in Australia where I'm from. I have to say I've never been mad keen on iris either but I thought this fragrance was just wonderful – light as a butterfly kiss on the cheek and just as memorable. It's delicately tenacious – if that makes sense. A quick whip around the office and everyone adored it. It's nothing like Prada's other maintstream scents; it's far more traditional then they, but the base is beautifully light and modern. It just doesn't bog down. Re scents spoiling or improving, it's generally the ones with strong base notes such as patchouli, incense, frankincense, vanilla (Orientals) that improve with age. I've had an absolute of Coco since it first launched and although it's turned dark brown it smells better than ever. Robin, it's absolutely fascinating to me to know which ones you choose to purchase. I would also love if you could give us a list of top ten recommendations of a year's releases, if you have not done so in the past. Thanks. You know, I don't do a top 10 of the year, but I do a “best of 200*” every year — check “general perfume articles” at the foot of the page. In a way, it is also fascinating to ME to see what I purchase. Like most people, half of what I buy is spur of the moment, or sometimes to fill “holes” in my collection as opposed to what I think is the best of the recent releases. Would be different if I waited til the end of the year and bought what I thought was best, you know? ABSOLUTELY IN LOVE WITH THIS FRAGRANCE! I am so happy with this fragrance. It is thefirst powdery soft fragrance since FIFI CHACHNIL to tickle my fancy. Something about it reminds me of FIFI…. Interesting — I didn't love Fifi Chachnil, but maybe I should try it again! Nice review! In my perception it is a unisex marketed as women's! Yes, unisex is a matter of point of view, but to me there is even a bit of classical masculinity to it. Although i agree with minette that the cedar/inscense is much stronger on paper than on skin. I only have tried once the little sample I got, and i was sniffing and sniffing trying to “grasp” the whole scent. I was a bit disappointed and found it a bit “thin” to be honest, but later the day I notices that even though it's light and stays close to the skin, but has a understated presence not to be underestimated. the woody notes support it quite well – at least on my skin. I think it's strange they didn't marked it as a unisex. It's equally so to me as Jardin en Mediterranee, if not more so. It's a different thing of course, but similar aesthetics. And it actually has a “Hermes quality” (or Ellena, for that matter) to it, I find it very “gardenesque”, natural, pure, friendly still elegant, understated and precious. Anyone see what I mean? Perhaps it is not marketed as unisex just because unisex fragrances are no longer so popular as they once were? I do absolutely agree that a man could wear it. I have been reaching for the Prada as much as anything else lately. And do see the “Hermes quality”, certainly. Very impressed with Daniela Andrier. Just sniffed Prada Infusion d'Iris on my wrist now, having nabbed a sample after reading with great interest about Iris scents. I went to your Resources section to look for an entry for iris, but to no avail (?). I'd mentioned to a friend that I was getting really interested in fragrance and that iris was an *important* note among perfumistas, and she said that she's dug up zillions of iris roots in the garden of all different kinds and never once smelled anything remotely fragrant about them. . .I will try to find your article on iris fragrances now to see what I can learn; I seem to remember it was quite recent, but, being new-ish to this site, and also not too sharp at the best of times, I'm not the best navigator. . .Thanks, R.
just had a “search” and read that iris roots have to be dried and stored (“insect-proof” it said in German) for 3 to 4 years, then pared and ground in order to allow to extract the “Iron”, the fragrant chemical. Also, the concentration is very low in the actual plant, which is why it's one of the most precious ingredients in perfumes. I guess that's also why you can't smell it from freshly cut roots. Thanks for chiming in — I've heard the same, but that there are some newer chemical processes allowing them to “cure” orris faster. Don't know if they are widely used though. I was finally able to try this and it's really lovely–also very light and subtle, as you've metioned. It reminds me of walking through moonlit, well-cultured gardens on starry, summer nights. The manderin mixed with iris hints at a slightly sweet, sugared-violet feeling. It's enchanting…if for no other reason than obvious simplicity and a chameleon character. It also evokes the illusion of strangeness when tested against rashly outspoken competition, yet remains only a hint of quiet essence on the skin (I guess “Infusion D'Iris” gets interesting in other company. It's easy to forget how unique it is for a modern release until you compare it to others). I liked this very much and if it had a little more staying power and richness, I'd probably be an avid fan. Nlb, what a grand description! I'd sign it. But I'm actually quite happy for it's subtlety. There are enough cudgel scents as well as enough short-lived colognes but rather few really subtle still characterful scents that stay on long enough. It's light but does last long while feeling completely natural. So far I love it. hey~I'm from HK and often read your comment on perfume before I buy one! I try this one in a duty-free pharmacy store today! It smells special, fresh ( like in a grassland), subtle and have that baby powder smells. I like also the woody smell in this perfume!!! Now after reading your comment, it's even more tempting!!!! I bought paul smith rose today instead, having read your comments on this one yet, and cant find it on amazon? Is it exclusive in asia market? Alexie, as far as I know, Paul Smith Rose has launched nearly everywhere but the United States. The Paul Smiths tend to take some time to arrive here. Just tried a sample of this yesterday (and unfortunately dropped the small vial on the floor and lost half of it…darn!). It reminds me of a subtle version of Chanel No 5. I used to wear #5 years ago, but can't wear it anymore. Too cloying. Infusion d'Iris is beautiful, though, and is now on my wish list! Hmmm…I'm wearing M by Mariah Carey today…received this as a gift. I have no good things to say about it, so I'll refrain. Looks like I might have to return it and use the $ towards a bottle of I d'I! Is that kosher??? Ha. Yeah. I vote for Prada, too. I'm sure he won't be heartbroken if I get rid of Mariah Carey. There was only one time he didn't like a perfume I was wearing. I was disturbed that many MUAers had said it smelled like BO, so I decided to see what he thought cause I didn't catch that “note” at all. He didn't know anything about the scent or about MUA. When I asked him what he thought about the scent, the first words out of his mouth were, “It smells like BO!” I was shocked!!!! Want to take a guess at what it was? Aqua Allegoria Pamplelune!!! Too bad cause I really liked that scent. Though some may think BO is a good thing, I surely don't. So, I gave it to a friend who loved it, and whose husband (whether politely or honestly) didn't think it smelled bad. She loved it, too. Pamplelune is a tough one. Smells just like sweat on me, nothing more, nothing less. But I do know people who love it! Robin couldn't find this beauty anywhere in CZ but my visit to NL gave me the oppurtunity to finally try Infusion d'Iris. I love it, so totally love it and indeed it has nothing in common with the current mainstream frags. If this is not copied over and over again in the near future than I would say that this is a true classic!! Feel pretty sure that this will also smell good on a man. Glad you got to try it, and yes, I do know men are wearing it too. If this is – besides of course Andrier's – Muccia's merit, she's really one of the most admirable people in fashion. I do not know how much Muccia gets involved w/ the fragrance, but my suspicion would be, more than most designers, simply because the fragrance line is so lovely AND so entirely unusual. They really do a great job at Prada. Thanks, Lars Lapsus! I'm enjoying this scent more as time goes by, as well. I'm actually finding it to be something more complex than I first thought. It develops into something velvety and powdery yet manges to be both sweet and androgynous. However, at times it feels oddly disconcerting on me and I question how good a fit we really are; in the end, “Infusion D'Iris” is either an auric mood ring or a sylph with its own personality–never to be underestimated! Well, after 3 or 4 squirts of this stuff on different occasions today's the day I finally 'got it' and am now off to hunt around the internet for a bargain bottle I think it might have something to do with the weather being at that tipping point between Winter and Spring (brilliant sunlight, still cold but with the first daffodils and crocus making an appearance) and the fact that – although I'll always love my deeply spicy scents, I need something a little cleaner and lighter. Am bidding on ebay – otherwise it'll have to wait until I've got a bit more spare cash! Marchlion told me I would probably like this scent…and she was right! I spritzed the EdT at Saks…and it smelled like water. Got a sample of the EdP – much better. It is very light but it seemed to hold for several hours. It went from being very cucumbery to something very light and ethereal…but with a nice little booomp! at the bottom. I was attacked w/this by the Nordie girl a few weeks ago. It smells *exactly* like the incense cones I used to burn in high school/college. It's a shame I can't remember what that was, since there seem to be so many fans of the scent. Loved it then, love it now, but not sure I can bring myself to wear it after smelling it as a room fragrance all those years. I finally managed to try this on my skin today. Previously I smelt it on a card and did agree that it was kinda light, especially in comparison to the original Prada Eau de Parfum, but on my skin – wow! It was actually quite bold, without being overpowering. What a beautiful fragrance! 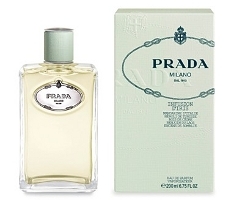 And I personally thought it smelt like a slightly lighter Prada Man but minus the intense soap that annoys me. And it's EDP too – simply brilliant! Just buy it! You will not regret it. Hey, there's a comment at the end of the Prada Man review from someone who has smelled Infusion d'Homme, sounds quite different. So now I say: buy the women's. I must say that I don't really like Infusion d'Iris because I find it rather plain and boring. It might not smell like many mainstream fragrance out there but it smells like a million of those department store cologne water / eau de toilette made by “granny-style” companies that make drawer lining paper perfumed with cornflower and lily of the valley. Today I tried the Homme version and I think it's miles more exciting. It's a vetiver and iris fragrance, it reminds me of Guerlain's Vetiver but it has a bit more depth. There are a bunch of notes on Osmoz description that I cannot smell at all – benzoin, incense, mandarin orange, neroli. Because of its lightness I think it can be easily worn by men and women. While the Infusion d'Iris gives me this goody-two-shoes nice girl impression, Infusion d'Homme gives me a quiet serious impression. Elaborate, interesting — I still haven't done a side by side test but then the women's doesn't strike me the same way it strikes you at all. Hopefully will manage to put the men's on skin soon. I'm a big fan of infusion d'iris! Has anyone tried layering it with l'air du temps? Question: How does one use the linen water? The tester at the store I visited was simply a giant glass vat of liquid with a screw-on lid – are you just meant to splash it onto fabrics directly? Or add it to the final rinse cycle in the wash? I'm accustomed to linen sprays from Jo Malone so am quite at a loss as to what to do with Prada's. Add it to the water bit on your steamer iron or put it in a spray bottle and spray on as you iron. Given the amount of ironing I do it would be a pointless purchase for me! Thanks for replying! How much should one use though? I just wish Prada had included a spray attachment – would be so much easier! This fragrance is perfect in every way. I can't abide those strong heavy perfumes that scream look at me! I believe most people wear those sort of fragrances because they think wow no one I know wears this, well there is a good reason for this (they are disgusting). I don't care who makes it or how much it cost they smell cheap and vulgar. Anyone with any class at all knows that being understated is something to be known for. I have tried both the mens and womens version of this fragrance and to my nose they are the same. I wear the EDP rather than the EDT and for the record all fragrance should be EDP. I bought the 200ml because that is how much I love this perfume. So keep your heavy amber,patchouli,sandalwood,and musk because I want to smell clean and elegantly understated. Why should all fragrance only come in EdP? Why shouldn't it? Why would anyone want to wear a watered down fragrance? The only thing better would be pure perfume. It's just silly to buy an EdT or worse an EdC foolish, foolish, foolish. A marketing ploy is all it is and I know many people who agree. Well, we'll have to agree to disagree; there are many fragrances in EdT concentration that I enjoy, and some scents, especially citrusy ones, I usually like better in lower concentration. Yes we will have to disagree. As for citrus I hate all of them not into smelling like furniture polish. Perfume should never have even a hint of food of any kind. I know you must be thinking IdI has orange notes in it but they are done without that tropical nonsence. It does seem like you've already established your scent tastes for life—should the rest of us be so lucky! See, the odd thing about scent connections is that some people would like to smell like “furniture polish”, not because they have some uncouth sense of style, but because scent connections are made throughout life and certain scents prompt emotion or nostalgia. Often times, people don't know why they are connected more to one fragrance than another. Neurologically, it's about how the brain stores and recognizes memories–information. Our reptilian brains were very adept at classifying scents for survival purposes and as our higher brains developed off those stems, we've carried such abilities with us. The pleasant outcome is that scent recognition gives richness to experience and those who've lost the ability to smell, remind others not to take it for granted. As for the sugar-floral-fruit craze in the markets: I'm convinced the popularity of fruity-sweet scents for the 11-24 age group has much to do with the scents that were included in toys and candies from the 1980's and 90's. People's bodies also respond differently to scent concentrations in addition to notes. While parfums are often considered superior, simply because there is such a high concentration of essences in them–parfums are denser, heavier, sometimes richer in character—edt's can have a charm all their own. Some scents unfold better in lighter concentration, where molecules burst through a carrier in a brisk, crystalline fashion (example: Chanel's “Cristalle”). While many companies tout the value of their ingredients, people who buy fragrance are not necessarily buying them for their separate pieces but for the final composition. If you prefer how a fragrance's notes unfold in lighter concentration, then it's worth more to you to buy the cologne or EDT, than the parfum. Often, cost is adjusted to be fair and EDTs usually cost less than EDPs and parfums because they include less of the essential oils. It's all about personal taste–you either like a fragrance, or you don't. I personally don't care how expensively priced a fragrance is or how fancily it's marketed; if I don't like it, I won't wear it. If i prefer the edt, than i'm wearing it instead of the parfum. What a nice & well-thought out response — thanks! Well now I see how this blog works. It only works as long as no one disagress with you. A well thought out reasponse, really? More of an attack on how I feel about fragrance. You really should tell people not to comment unless they are in total agreement with you, I am very disapointed with this blog. I really had alot of respect for you now not so much, what a shame. I know I'll recieve nasty comments for saying this but at least I wont be suprised by them. You won't receive any nasty comments at all. I didn't see the above as an attack on you in the least — I thought it was a good explanation of why not everything should be in EdP, and I thought that might be helpful to you. If it wasn't, I'm sorry to hear it. Excuse me?! First you bleat out your “fragrance should” and “should not” and who has “class” in an extremely provocative way and then you can't deal with a (relatively restrained) response. Your statement is more like an attack on how I feel about fragrance. I don't use furnish polisher and for me the citron etc. came first and the polisher much later. BTW, I think foody scents are an interesting topic. While recently I've come to enjoy some gourmands (e.g. Exté Man, Gaultier Puissance2), I still would agree that “elegant” and “foody” doesn't go well together. I also got bored by all the foody releases these days. I guess for me it has to do with the fact that elegance does not succumb to convenience and comfort, but sustains a certain self-restraint, an expression of holding something back. Elegance has to do with distance. Foody scents in contrast are above all inviting. Sometimes pleading for sympathy. The interesting thing about gourmands though is a potential flickering between “eat me!”/”don't eat me!”. Infusion d'Iris is indeed a great new fragrance, and I still would say it's more interesting than Id'Homme. The latter to me is basically the same without the Mandarin top and slightly flowery heart note and it's more linear. Any man interested in these 2 should get the woman's version which smells perfectly unisex. I really think the release of Id'Homme was pretty superfluous (but probably very profitable, reading some opinions on it). I don't BLEAT I'm not farm animal that is an inappropriate remark. Ok guys. It's rare I delete comments because people start arguing w/ each other, but I will if I have to. The next rude remark, called for or not, gets deleted. Sorry to Jett & Robin for inappropriate remarks and causing stress. I'm slightly embarrassed because I need to sniff Shalimar again to be able to discuss it… but I think for me gourmand stands for a caramell/bread crust foodyness which appeared in the 1990. Sweet was there before, but wasn't “edible” sth new? Lars, no worries, just didn't want anything to escalate. It's true — Shalimar is a vanilla bomb but I wouldn't normally call it foody, but I'd say the same of that JPG whatever it's called. To Lars thank you and lets put all of this behind us. I have read many of your comments and they are very well written. So lets pursue our passion for perfume and have fun while we do it. Thanx for the link. That's interesting! I agree that Vanilla alone doesn't smell foody. Is it the incorporation into a malty/caramell/”pudding” accord which makes it foody? I get this in the Gaultier—the foody component is probably often hidden behind the expression “musk”. Must pH or Caron's p. un Homme would be my examples for (gorgeous) Vanilla bombs completely inedible. The herbal says “do not eat!”. “Gourmand” is omnipresent as a topic, but were it ends or begins seems to be very personal. On the other hand, I tend to believe that if you are more professional definitions become clearer and it's just us hobby sniffers who avoid exposing our lack of knowledge by saying “well, you know, it's all very personal”. Chandler Burr or Luca Turin would probably start talking about molecules in this context. Initially I even found Pradas Amber p.H. or Marc Jacobs slightly, and Arpège pH strongly foody (I was thinking it could be my perception of some new musk). But really, my sense for it got blunted and now I just find them a pretty sweet. Then, if you compare them to a “take the gloves off” 1970s fougère (or a dry new, say, Rive Gauche) or an old Jean-Paul Guerlain you realise how much more elegant perfume can be if it completely refuses to address your stomach. I think the situation also triggers interest for those survivers as Tabac, Old Spice, Aramis etc. (they write about them everywhere these days). Sorry I can mainly speak about men's. But women have Kenzo Amour et. al. and the countless Angel clones as the extreme on one side, and I hear you constantly complain about the fruitiness of many florals. I think actually it's the “foodiness” we are all getting tired of. Infusion d'Iris is a welcomed exception (see what I did there? ). What a lazy sunday… I have to get a shower now and then I feel like some B*men… ooops, meant to say Habit Rouge. With Id'I being an exception I meant it's a rare non-foody new release. I don't know about the expert vs. non-expert — I mean, Michael Edwards classifies perfumes by smelling them, not by ingredient lists, right? Personally, I like some, maybe even many, foody scents, and my objection to the ubiquitous fruity florals is that the vast majority are not particularly well-done, much less distinctive. I just got this perfume recently – I really love it! I think this perfume works well on a dry cool skin – or somehow it works with my body chemistry. I wonder if this is because it doesn't have too many synthetic notes? My absolute fave perfume was Bulgari Black (discontinued) and this has similar dry, powdery yet lingering and sensuous qualities. The quite strong citrus notes put me off at first, but the dry-down is gorgeous – a summer twilight walk in the woods! Reminds me of romantic holidays..
A “summer twilight walk in the woods” is a nice description of Infusion d'Iris! So far as I know, Black has not been discontinued though. I wanted to find a “signature scent” this year, after many years of using an after-bath splash that evaporated 30 minutes after I applied it (not quite the “lightness” I was seeking!) I liked the smell of the sugary/chocolatey perfumes but after putting them on, I smelled like a sweet, sticky mess. I ended up buying Guerlain My Insolence but then realized afterwards that I didn't like it. I searched for it online, found your site and your review, then began educating myself on perfumes. I realized why I made a mistake in buying My Insolence: I only liked the initial top notes only, but after they faded I HATED the smell…too sweet and strong and I didn't like the “Guerlainness” of it. So I was thrilled to find your review of Infusion d'Iris. I love Infusion d'Iris…I'm actually going to buy it after work today. I tried it on my wrists last week, and the whole night I could not stop sniffing myself. To me, it feels fresh, soft and light. Definitely like “a sheer veil”. It's perfect – thanks to you I I found my signature scent. Thank you!! How nice that you found your perfect scent! Now I wonder if you'll stop there or if you'll get hooked on perfume?? I've kept it in the original box by the way, as per your advice. I admit that I would prefer to have the bottle on the tray, but I don't want it to go bad. Once I get a vanity with drawers I'll keep it in there. Is it okay to store it in a drawer laid horizontally, or do you recommend that I keep it upright? But hey — if you've only 1 bottle, open it and put it on the tray! When you get to 20 bottles so you know you're not going to use them up quickly, then you can start to be concerned with spoilage. No idea on the laying flat — never did it! Don't see what difference it would make. The only reason why I'd lay it flat is if I wanted to store it in a drawer (to keep it away from the sun, as you said) and it didn't fit upright. Thanks for your comments above about my comments. Due to a fortune of good luck I now have 200ml bottles of both D'Iris and D'Homme. I can now smell a bit more of the iris and woody bits of D'Iris but I still prefer the D'Homme. On me despite that D'Homme is EDT and D'Iris is EDP, D'Homme for some strange reason is more long lasting than the D'Iris. After 20 odd hours I can smell D'Homme just by moving around but for D'Iris I have sniff hard on my clothes to spot any after only 5-6 hrs. To Lars – I actually prefer the or lower doses of neroli in D'Homme compared to D'Iris, but this is an entirely personal preference. So I guess I luck out in this case! To Lars – one more thing just occurred to me – lots of “grannies” perfume (and I love them!) are actually quite woody / incensey and although we call them grannies today, they were young girls once thus the good girl and linen drawer lining paper (and the flower prints on them!) associations I got. You know, I just tried Après L'Ondée some days ago. The Guerlain woman asked me if I wanted her to “perfume” me for a test and when I agreed she told me to close the eyes and pffft pffft pfffft pffft… I disappeared in a vapour of powdery greens, beiges and purples. But it's so light it wasn't overpowering at all. Now that I read your post I realise A l'O in a way has some similarity to I d'I. On top of that it officially is also a “walk in the landscape” scent. Elaborate, I think I know what you mean. I can see some similarity between Id'I and some English “Granny” scents, think Yardley. I still prefer Id'I, just sniffed them both in an airport today and decided to get Id'I for myself some day (prob. No. 3 on my wishlist). It's strange, but for a while now I'm kinda bored by (new) men's scents and more intrigued by females. Wow, then you've 400 ml total — that's a lot of juice! I did eventually get to try the Homme on skin, and I still prefer the women's, but they're not so terribly different to me — I'd wear either. I read your review on this edp a while back and made a mental note to try it as it sounded heavenly. I received a scent sampler for Christmas and was ecstatic to find I d'I included in it. It did not disappoint. I found it very sheer, but at the same time a hint of depth. I'm 15, and didn't think of it grannyish in the least as mentioned in a few other comments. This might be due to the fact that my grandmothers mainly wear CD Poison and Armani Diamonds. They don't normally florally scents and my mother boycotts perfumes altogether, leaving me to explore that realm. I agree with someone who wrote that it had an air of intelligence. Personally, I just love it and can not get enough of the smell. If I haven't grown tired of it by the end of the sample (as it often happens with me), I won't hesitate to invest in a full size bottle. How nice that you love it so much — hope a bottle is in your future! After wearing D'Iris for a few days I think I start to get it a bit more! Yup 400ml of juice I will work hard to get through them for sure as they are both nice! I love love love the Prada Homme, and have been lamenting that there is no woman's version. This (on a card) reminds me faintly of it. I bought a miniature, so I will see how it works on me. If it smells half as good on me as Prada Homme does on my husband, I am buying it! Interesting — I don't think I ever noticed the resemblance! I am new to this fragrance having smelt it on a friend and found out what she was wearing. To my nose it is a combination of two of my favourite fragrances….l'air de rien and Philosykos(the latter thanks to your recommendation)….I am thrilled to have found a new and interesting scent….but I wish it had more sillage. Both of the other two hover around my skin and I can enjoy them without having to sniff up and down my arm…lol. Very interesting previous comments on this one!!! It really is a very close to the skin scent, and so is the men's version. You might want to try the Prada Exclusive iris, which as I remember is much stronger. Would cost you more though! What a great idea…I will have to try it with Kelly Caleche! One of my favorite scents of all time. It is perfect for almost any weather. I actually prefer it over Infusion D’Homme (which I also have). IdI just has something more substantial in it, I don’t smell enough of the incense in Infusion D’Homme to make it interesting enough to wear on a regular basis. I like this one better too…and still puzzled as to why they made 2 versions at all. It is definitely light, but has lasting power. I tried my sample last night after my bath, and can still smell it this morning. My husband picked up the incense notes right away…the man has a good nose. It feels not at all old-ladyish, but it’s still a very womanly perfume — not trendy or teenybopperish at all. I think I’ll be investing in a bottle when my sample runs out. Hey, he does have a good nose! Is it possible that the spray formulation would change the scent? I had ordered a sample of the EDP from The Perfumed Court and just loved it. So then I saw someone selling a bottle of the EDP, in the original packaging, on EBay, and decided to give it a go. It smells different. It’s sharper, and a lot of the warmth seems to be missing. The seller is being good about it and is offering to refund my money, but I’m just wondering if maybe this is normal. I don’t want to go buy a bottle at a department store, only to get it home and be disappointed again. It’s probably sharper because it hasn’t lost any of the top notes in decanting…but that’s just a guess. And you don’t mention if the sample you bought was a spray or a vial, but yes, that can make a difference too. IMHO, it isn’t really fair to make the ebay seller take it back since you have no evidence that anything is wrong with the bottle. The sample was a vial. What you are saying makes sense, in light of that. One option, then, is to decant the perfume into a plain bottle & dab it on…you might then find that it smells like you expect! I’ve done that with several fragrances. Great idea! Thanks so much for all your help! Oh, what a shame — it lasts very well on me. Does anyone know if Prada makes a deodorant for the Infusion d’Iris for women? I truly love this scent – but I like to layer with bath products. I have the body lotion and will order the bath gel but haven’t seen a deodorant. (I know for D&G The One, for instance, you can only get the deodorant outside the US.) Anybody know about d’Iris? Woohoo, gotta get me some of that. A friend of mine has got some Prada Infusion d’Iris candles in her hallway and every time i walked past them, I could smell that stunning aroma that just stayed in my nose and I could not stop thinking about it!! Sooooo delicate yet very sensual and sophisticated. Had to get myself a bottle of this, and its just beautiful. I can smell it all day long on me, and i spray it in my hair for some extra lasting effect too ( no wonder my boyfriend cant stop sniffing and playing with my hair!!!!! :-)). He loves this scent on me, so I got the 200ml bottle of it the other day. Now I need the bath stuff too, and I am desperate to get the candles too!!!! So glad to hear the candles are nice, I hadn’t tried them. Picked this up today (50 ml for $24, yay for bargain bins!). It’s exactly what I’ve been looking for – a summerweight scent that doesn’t smell like a Glade plugin or pool water and manages a bit of earthy interest in the drydown. I get more green out of it than citrus, and a slight tarragon/anisic strand runs throughout, with a hint of cosmetic-like powder in the heart that makes me think of the inside of my grandma’s house (is that the iris?). It’s on the light side, but I don’t find it nearly as ethereal as it’s reputed to be. It stands out but blends in, if that makes any sense, and makes an ideal skin scent for…well, those skin scent days, which I’m having with rather more frequently lately. I adore my atom bomb fragrances but am finding them harder to wear than I used to. Also, I’m not a bottle fiend, but the packaging for this (and all the other Prada scents) is exquisite. Simple, elegant, yet stylish. I love Iris too but now I am insanely in love with Iris 39 from Le Labo and I am not sure if you have an idea about how they compare. I like Prada fumes but I do not find them very innovative either, I am ok with Prada Candy but kind of sorry I bought it even on sale as it is not really me, I could see it be better layered over one of their amber fragrances. I have a feeling that I would still find this too shallow. I want my flowers deep and animalic, take Iris 39 or vintage Diorissimo as an example or even Love, Chloe somewhat. This might still be worth a sniff, however, I highly doubt that it will knock Iris 39 out on my to buy list. The Le Labo is much deeper & darker. I also bought this at full price and at an instant! It is so clean and addictive. To me it smells like soft violets, and oddly like the lovely clean, waxy smell that lip balm, such as Rose’s minted rose balm, has! I have always wanted a perfume that has that clean, waxy smell and this, oh, too lush! I like it so much but I don’t consider it very intense. I bought the body emulsion to ”enforce it”. But we are talking about Infusion EDP, the first they released. The later EDT, which came out in 2010, is a different perfume. Robin, in my country you find only this, infusion dhomme is not imported. can i use this one or is away from the male version or too feminine? Try it, but I think you can use it. If you decide it is too feminine, you could also layer it with Prada Homme. My wonderful father just bought me a gift set, for my 26th birthday. The set came with a 3.4 oz bottle of the EDP, a lotion, and a rollerball. While I generally like to wear heavier fragrances, and needed a new spring/summer scent. I had my eye on Infusion D’Iris for a while, because I felt an iris perfume would be wonderful for the warmer weather. Infusion D’Iris is so elegant, sophisticated, and timeless. It is so different than any of my other perfumes, as I generally hate light and fresh scents. Nice gift, and happy birthday! What ages do you think this is appropriate for? I’m on early 20’s and thought this smelled delicious in store, but when I got home and spritzed it on I thought it might be too sultry and sophisticated. As if my mom should be wearing it rather than me. Well, it’s all perspective. It does not smell sultry to me, or “old”, but it does smell sophisticated. It would not seem odd to me to smell it on a 20 year old, but if it feels wrong to you, then why wear it? There must be something that you’d feel more comfortable in.